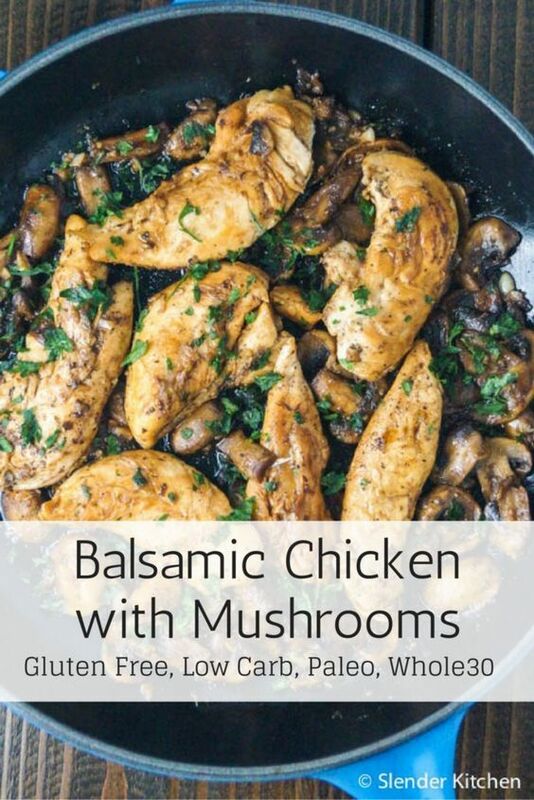 Balsamic Chicken with Mushrooms and Thyme is one of those meals that you will make over and over again. It has so much flavor, couldn't be easier to make, and tastes like a dish you would get in a restaurant or at a fancy dinner party. This dish is quickly becoming one of my favorites. Golden brown chicken breasts, earthy mushrooms, a slightly sweet and tangy balsamic vinegar and thyme sauce, and a sprinkling of fresh parsley. Yum. As an added bonus it feels like a gourmet-style dish and comes together in under 25 minutes. Plus we usually grate some fresh Parmesan cheese on top or finish it with a good sprinkling of goat cheese. Nothing better. I absolutely love dinners like this. They're fancy enough to serve for guests but simple enough to make at home any weeknight. And most importantly, it's a meal you can feel good about feeding your family. With only 214 calories and 5 grams of fat, it's good for you and also low carb, gluten-free, Paleo and Whole30 friendly. It's also all cooked in one pan, which makes clean up painless. Season the chicken with salt and pepper. Heat the olive oil over medium high heat. Add the chicken and sear on both sides until golden brown, about 2-3 minutes. Remove the chicken and set aside. I used chicken tenderloins but any chicken breast will work. For large chicken breasts, cut into smaller tenders or cutlets to ensure they fully cook.